An exploration of different mediums for adults of all ages and skill levels. We will be working on Book Making the month of April and May 2019. Friday mornings at 10:00am. $40/month. A beginners art class for ages 4-8. Explore multiple art mediums in a fun group environment. Children ages 6-100 come learn the basics of quilting in a fun class. No sewing experience needed. 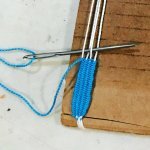 Learn to weave on a simple loom. Make a bookmark or bracelet from your creation. Lots of fun colors and textures to chose from while learning the basics of weaving. Materials included. Come learn the basics of sewing and create some fun items for you and your friends. Ages 6 and up.